Tara Lynch (a.k.a. 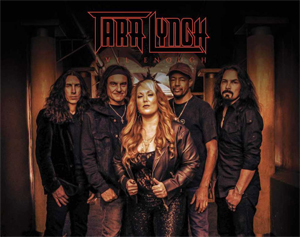 "Gui-Tara") is a guitarist, composer, vocalist and songwriter who delivers heavy metal thunder with prominent melodic guitar riffs, shredding leads and powerhouse vocals. She will release her debut album, Evil Enough, on March 1st in Europe/UK via Cargo Records UK. Evil Enough is a melodic metal album featuring Lynch on all guitars and vocals along with an all-star lineup of guest performances by Vinny Appice (BLACK SABBATH, DIO), Tony MacAlpine (PLANET X), Phil Soussan (OZZY OSBOURNE, BILLY IDOL), Mark Boals (DOKKEN, YNGWIE MALMSTEEN), Brent Woods (VINCE NEIL, SEBASTIAN BACH), Glen Sobel (ALICE COOPER) and Björn Englen (DIO DISCIPLES, YNGWIE MALMSTEEN). Evil Enough is produced by Brent Woods. All words and music written by Tara Lynch. 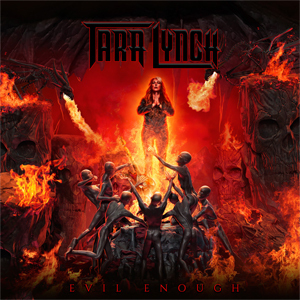 Says Tara: "The entire Evil Enough album is a musical autobiography. Very often, the term 'blood, sweat and tears' is used as a metaphor to describe the work one puts in to something that they are 110% invested in. This would be an accurate metaphor where I am concerned. It has been a tremendously emotional journey into my own soul in order to both write the lyrics that explain my experiences, as well as write the melodies to convey the feelings involved within each experience." Tara has this to impart: "This album has been a labor of love and an important part of both my personal and musical growth process. At the end of the day, it's an album that I am extremely proud of and I really hope it touches people out there in the world who can relate to it and that it can help them know they're not alone."